The Early Show's Julie Chen and CBS Sports' Boomer Esiason host the Thanksgiving Day Parade, an entertainment-packed, three-hour special, that has been a CBS Thanksgiving morning tradition for 43 years. It will feature performances and attractions from parades in New York and in Miami Beach. Joining Chen and Esiason covering the Macy's New York parade will be model and spokeswoman Daisy Fuentes and the NFL Today's Deion Sanders. They will interact with the crowd and report from Columbus Circle. Leanza Cornett, Miss America 1993, and Mark Steins of Entertainment Tonight, will be hosting the Miami Beach Thanksgiving Parade coverage. There also will be special performances from Broadway musicals and a performance by the Harlem Boys Choir. 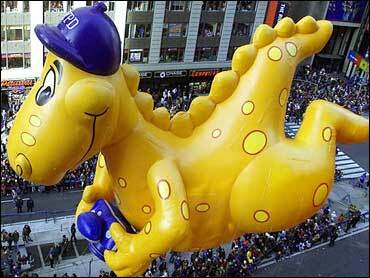 This is the 76th year for the annual Macy's Thanksgiving Day Parade. There will be something for everyone with 1000 cheerleaders, 500 clowns, 25 floats, 14 giant helium balloons, 12 marching bands, 10 novelty balloons, 4 toy floats, scores of celebrities and more than 4,000 employees. For the 2002 edition, there will be a colorful cast of new giant helium balloons - like Charlie Brown, Kermit the Frog, Little Bill and Mr. Monopoly. They join returning favorites like Barney, Big Bird, and Clifford. In the novelty balloons, a brand new Uncle Sam will debut. Coming down Broadway will be seven new floats, including Radio City's "A Christmas Carol," Angelina Ballerina and Barney's Playtime In The Park. Besides all the bands and cheerleaders, the parade includes a star-studded line-up of silver screen and stage legends including F. Murray Abraham, the Baha Men, Alan Jackson and The New York City Ballet. And of course, the finale is the appearance of Santa Claus. Again this year there will be a few concerns. As it was last year, security will be beefed up along the parade route. The question last year was if the events of Sept. 11 would deter people from coming out or dampen the enthusiasm of the folks who do show up. Well, that never happened as throngs of people lined the parade route last year and there were never any incidents. This year should be the same. The other concern will be something that everyone worries about every year - the weather. The biggest problem for this parade is the wind, which can make havoc for the gigantic balloons. Several years ago, a wind gust took hold of the balloon, running it into a lamp pole which fell apart on top of a woman spectator, injuring her. If constant winds exceed 23 mph or wind gusts exceed 34 mph, the balloons will not participate in the parade. This is a decision that parade officials will not make until right before the parade starts at 9 a.m. This year, the forecast is for a sunny day and light winds but the temperatures will be cold - in the low to mid 30s. At least there will not be any over snow left over from Wednesday's storm, which hit the north and east of the city. Hosted by husband and wife Leanza Cornett and Mark Steines, the Miami parade will include stars like Tito Puente Jr., who will perform the Santana hit "Oye Como Va," and KC (from KC and the Sunshine Band) who will perform his disco hit "That's the Way I Like It." Jon Secada, Jorge Moreno, MSM and Olga Tanon will also perform during the parade coverage. Throughout the broadcast, there will be special musical performances. Performances from the Broadway musicals "Rent," "Cabaret," "Man of La Mancha," "Stomp," "Mamma Mia!," and "Flower Drum Song" are scheduled as well as a performance by the Harlem Boys Choir. Joey Fatone of *NSYNC, who is currently starring in "Rent," will perform with his co-star, Sebastian Arcelus. Molly Ringwald will perform the title song from the second longest running revival, "Cabaret" and The Harlem Boys Choir will sing "Winter Wonderland." Also performing will be the cast of "Mamma Mia!," the cast of "Stomp," Brian Stokes Mitchell, who has the lead in the upcoming production of "Man of La Mancha;" and stars from the Broadway show, "Flower Drum Song."